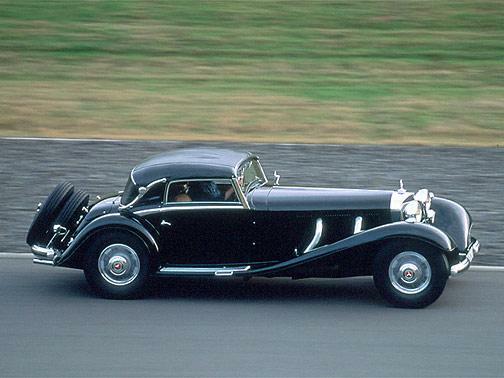 Is the 320 a combinations coupe? What is the asking price of that one? 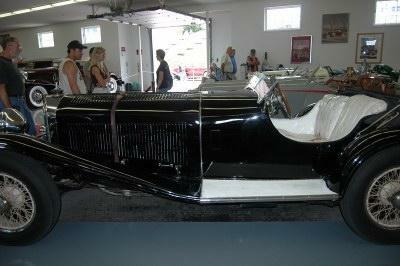 This is an unrestored but complete car. 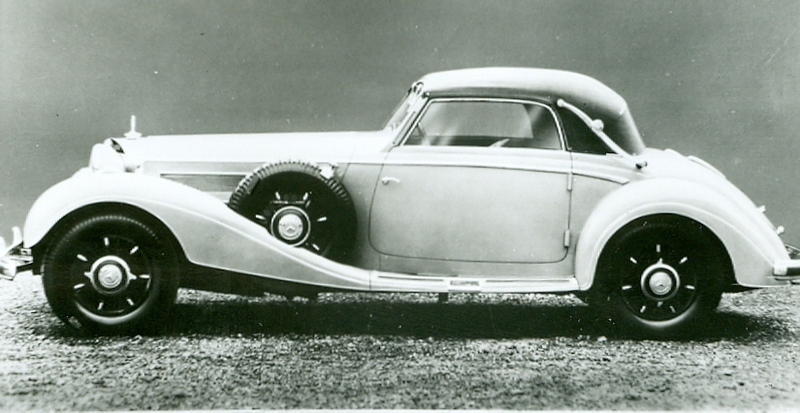 I updated the description to the correct "combination coupe" moniker. Restored 320 long wheel base cars are going for 500 to 600k now. I would think that this car restored would be more then that. I'll pm you the details . Here is one of the very few 540ks made with the 500k Cab A body. Or, maybe more accurately, 500k chassis and body with a 540k engine? Any photos of an SSKL? I saw one once in a garage in Mass many years ago, any Ideas where it went? Photos? Do you remember where and when? I was not aware of a real SSK in our area. I didn't think any or maybe one or two of the drilled cars survived. I have some decent S & SS pictures I should dig up. My dad was underbidder on the 4k miles from new SS at the Byrd estate auction back in the early 60s. He only brought 5k and the car went for 5100. We were talking about that A.K. Miller auction in another thread but the Byrd estate auction was arguably the greatest estate sale of all time. Is Bob Bahre's an SS or SSK? For some reason I was thinking the latter but I haven't seen the car for about ten years. Also, the beautiful Mercedes that used to belong to DePedroso (sp?) in the Philadelphia area. What a fantastic machine! Bob's car is an original SSK. I'm not sure of when or where he acquired it. He has one of the great private collections in the world. Agreed that the Bahre collection is outstanding; however, having recently been through the Collier Collection I have a new appreciation for great collections. Here is a link to a full picture spread of Bob Bahre's collection. This is an interesting one. 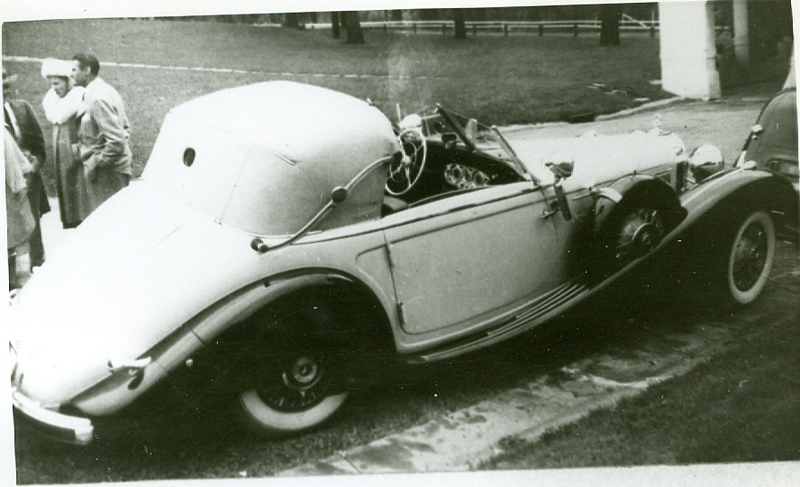 This car was owned by Opera Singer James Melton in the 1940s. I have a number of pictures of it at the Indy 500 one year. 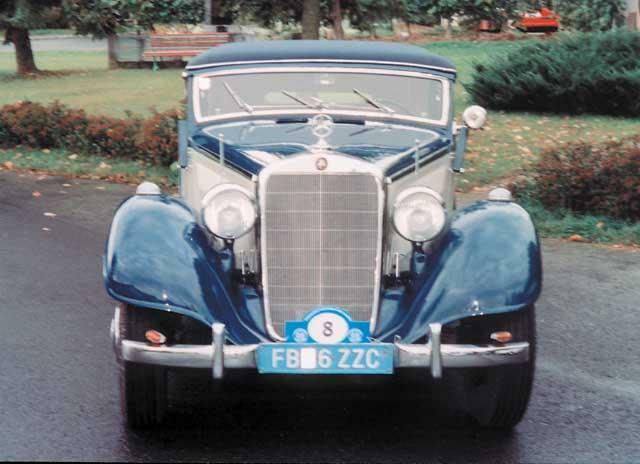 It is a Cab "A" body with Cab "C" doors and Special Roadster fenders. I also believe I have pictures of it in the 1980s minus the fender skirts. There was a similar car sold at the RM London auction sale in 2007. They may in fact be the same car. I'm going to guess that they're different cars, based on the location of the spare tires, different taillights, skirts, parking lights, turn signals, size of the elbow joint on the laundau bars, etc. The "history" of the auction car is unknown before 1995. 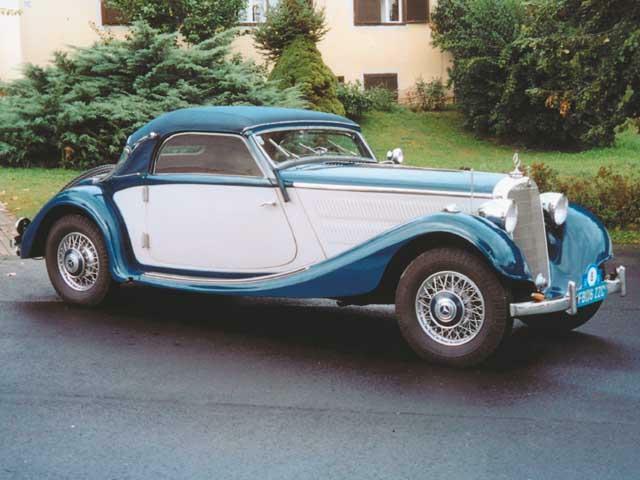 I saw a similar car in the Mercedes-Benz collection "vault" in Germany about 8-10 years ago, which I think may still be there, also with the Special Roadster features. That may make three cars like this in existence. Hmmm, a supercharged MB with no history? Pretty much impossible. The records exist in incredible detail. I agree, just repeating what the auction info says. Makes you wonder, doesn't it? Yeah, I guess the spare location was a give away. That will teach me to throw this stuff up on the fly. I'll dig out the pictures I have of it in green because that car has the sidemounts and I believe it's the same one. They both have a number of similar features however. MB has all the historical data on the Sindelfingen built 500k/540k lines. That includes a build sheet that will give you the body color and interior color and sometimes additional details. Also in most cases they know the original owner and date of delivery. 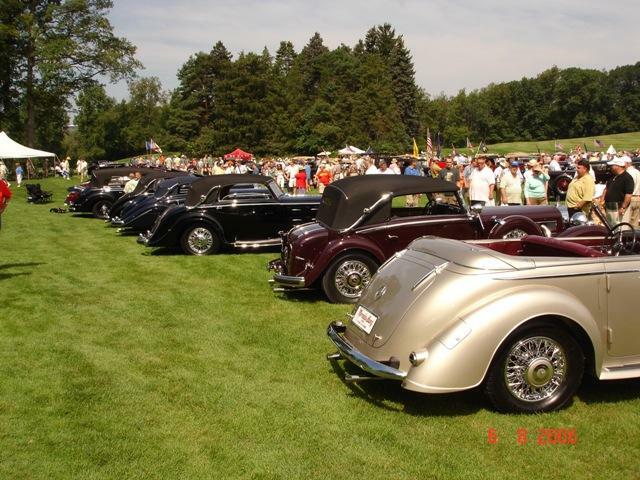 For the Mannheim built cars which I think is most 320 models and below, they do not have that information. If the owner does not go through the effort to get the information from MB the auction company cannot do it as MB will not release the records to anyone other than the owner (who must prove they are the owner). In general the auction company just parrots what the seller says. In this case, Bernie Ecclestone owned a bunch of cars and it is possible he never got around to it. I personally would not buy a car without knowing the full history, however I think this car is legit. Although very fancy, it's not exactly the body someone would cobble up from scratch. I just have to think that if someone was going to go to all that trouble (many years ago) then they would have built a full special roadster replica. I would have to agree, but clearly RM didn't care to look into this. For the money they made on that sale they could have put some effort into it. Ecclestone may not have had the time, but he could have had someone research it for him. I think MB would cooperate with him. These cars don't just pop up out of thin air. From my understanding, the records on almost all of the prewar cars exist, but some are in bad shape, or not organized and in could be in different locations and the historical dept may not even know how to find them as they are much more into the records from the 50s and newer. I know that MB won't release a lot of info because they think that people will build cars to match serial numbers, which of course has happened with other makes. I agree with what you are saying with regards to tracking down the info. You would think on a million dollar plus car somebody would have spent the 20 minutes to send the form to MB. 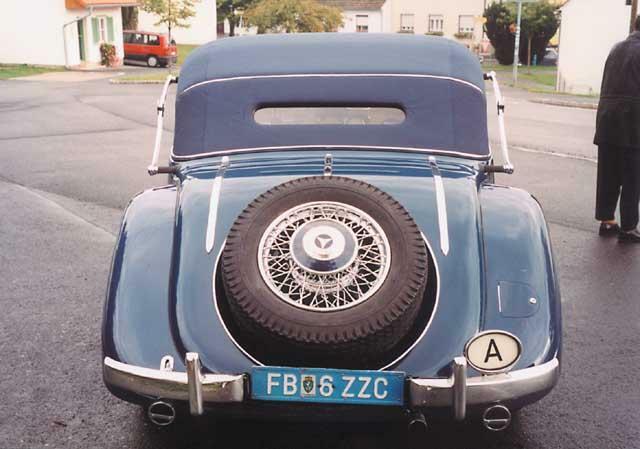 Btw, I believe that car is pictured in period on Page 68 of Jan's first book. It would be great if you could get info on some of the lesser models. I didn't think this was possible. With 320 Cab A bodied cars going for 500k plus I think the temptation to build a few is out there. 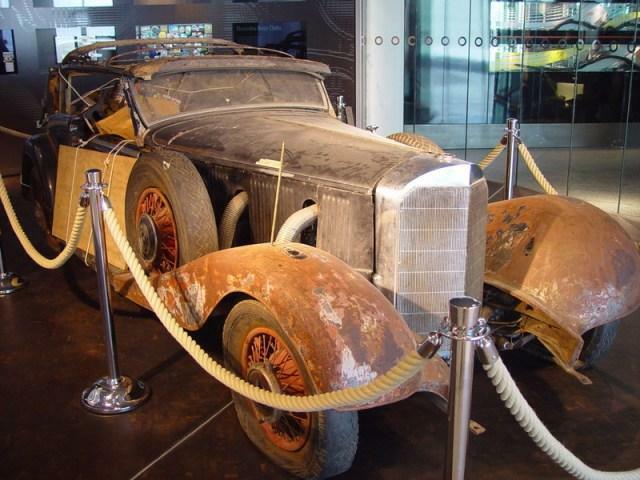 Here is an unrestored 1934 500k Tourenwagon. Here is a rather rough 500k Cabriolet "B". I recall that back around 2001/2002 Leo Gepart was brokering a very similar car that was located down in the South East U.S.A. The asking price was around 150k and I believe the car was sold off to Germany. It could be this car. 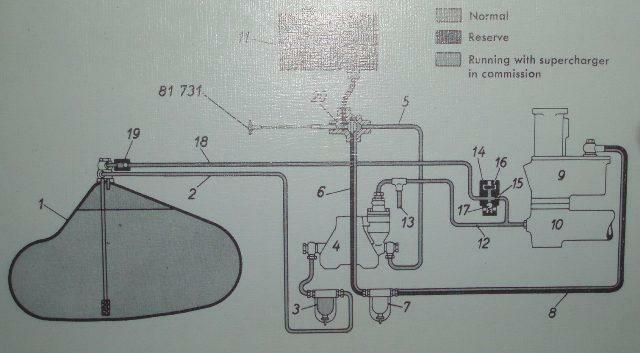 Here is a diagram from the owner's manual of the 500k/540k fuel system. It is very very complex with the necessity to pressurize the fuel system above the 7psi that the blower puts on to the carburetor. A row of nice looking 500k/540k/770k at 2006 Meadowbrook. 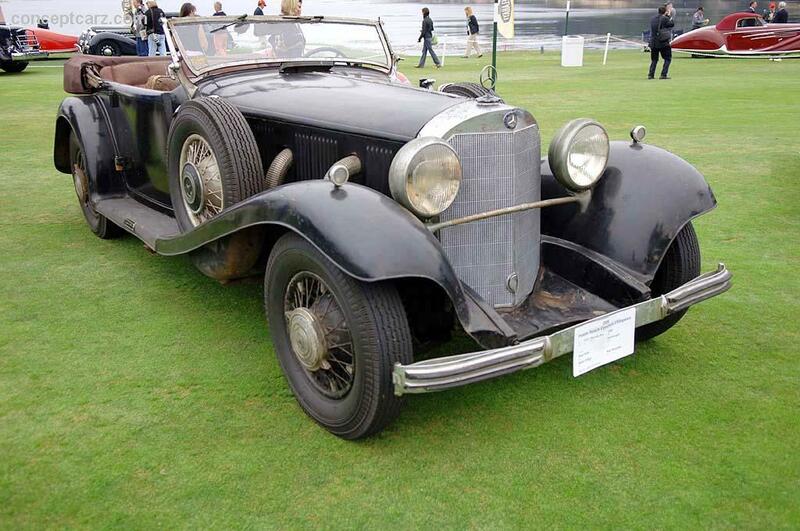 Here is a long wheelbase 320 Cabriolet "A". frames got lost during plating and Tom was not happy.